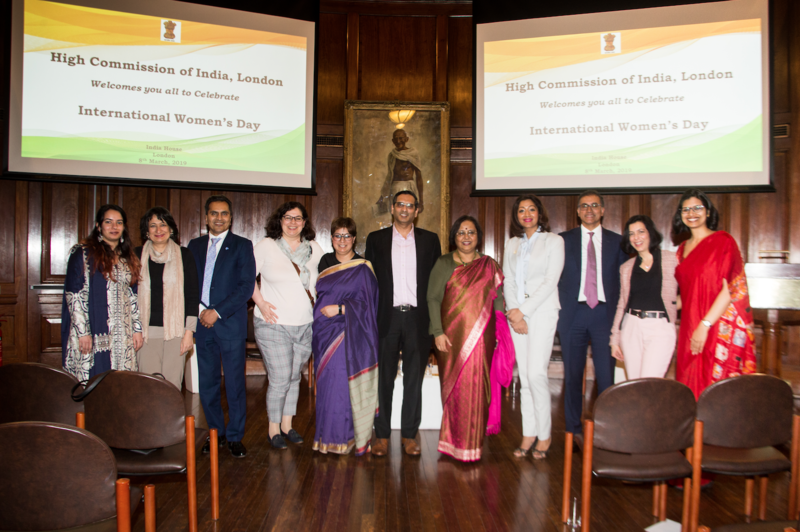 International Women’s Day was celebrated at the High Commission of India on 8th March 2019. The programme was presided over by the High Commissioner, Her Excellency Mrs Ruchi Ghanashyam. The programme included a panel discussion on “Balancing Parenting and Career” which was based on this year’s International Women’s Day theme: #BalanceforBetter. A packed room of over a hundred people, attended the programme (hailing from various professional and cultural backgrounds). The High Commissioner of Bangladesh, HE Ms Saida Muna Tasneem was the Guest of Honour and the opening remarks were delivered by HE Mrs Ruchi Ghanashyam, High Commissioner of India who spoke about the increasing women representation in Indian Foreign Services especially as Heads of Missions around the world. Mrs Ghanashyam shared her own personal journey in her career around the world and said, “It is important for women to stand up for themselves and call out injustice when they see it. Most of us are victims of our own inability to speak up when we can.” She commended women standing up for other women and welcomed the High Commissioner of Bangladesh, HE Ms Saida Muna Tasneem who congratulated Mrs Ghanashyam on her appointment and thanked her for the invitation to be a part of the IWD2019 celebrations. Recalling her own journey as a woman Ambassador she recognised the importance of solidarity, support and community of women for women. Confederation of Indian Industry (CII) organised a set of panel discussions that were conducted by Ms Lakshmi Kaul, Head & Representative – UK, Confederation of Indian Industry (CII) with an esteemed panel of guests. The panel examined the theme: #BalanceforBetter and examined Parenthood as a factor in gender gap on the professional front. “The premise of the discussion was that the prime of an individual’s career and his/her early parenting age coincides (25-40 years). This is also the age when career is at a fast growth trajectory for most individuals. The panellists shared their wide ranging perspectives including parenting, non-parenting, career progression, achievement targets are facilitated by not only implementing workplace changes but also involving families in the process,” said Lakshmi. The guests on the first panel, “Parenthood and Career: How to strike the balance” included Avnish Goyal, Managing Director, Hallmark Care Homes, Vinati Sukhdev, Executive Director, Pratham UK, Maithreyi Seetharaman, Director, Fortune (Live Media Content), Co-Chair, Fortune Most Powerful Women Network and Philip D’Costa, Partner, Pennington Maches. The panellists spoke about their career and parenting paths reflecting on good practices that helped strike a balance. * Family First: actively involve families especially children to strike a balance in parenting & career; children are key stakeholders. Ensure work life integration as opposed to trying to balance work and life independent of each other. * Encourage women to pursue male dominant career streams. * Boardroom Composition: Go back to your boardrooms and review what might need to change. More women ought to be in Boardrooms and senior leadership roles. * Make HR Policies effective: Paternal leave ought to be compulsory however, it is important that fathers avail parental leave. Reduce the gender pay gap by incorporating fair professional assessments. * Be Inclusive: Stop feeling the discrimination in thought. Be conscious of the inadvertent bias at workplace and home – be sensitive and compassionate. Relook at recruitment (selection) and promotion policies within HR to ensure inclusivity and opportunity. * Celebrate womanhood instead of trying to be a man at workplace. * Support women out of work to get back into work by offering reskilling opportunities; offering adequate career goals and equal opportunity. The “Call-To-Action” as part of the #IWD2019 is being followed up by the Confederation of Indian Industry (CII) via its members (Indian Companies in the UK) at the India Business Forum (IBF) as a formal ‘Working Group on Inclusivity at Workplace”.